The Centers For Medicare & Medicaid Services (CMS) has proposed a revised Local Coverage Determination (LCD) for BRCA* testing that is bound to make genetic counselors equal parts happy and upset. Whether you are mad, glad, or confused, CMS is seeking input so you have the opportunity to applaud, chastise, or critique the proposed LCD as you see fit. The guidelines are too numerous to detail here, so I will highlight a few that are particularly relevant to the genetic counseling community. Please, please, please carefully read the guidelines yourselves. The most radical change is that, as I read the LCD, it appears that genetic counselors are poised to become covered Medicare providers. In the section on coverage for multigene panels (itself a disappointment, vide infra), one of the criteria that must be met is “Pretest genetic counseling by a cancer genetics professional” defined as, among others, a Genetic Counselor certified by the American Board of Medical Genetics or the American Board of Genetic Counseling. Amen to that. This is a huge step forward for the genetic counseling profession and for patients covered by Medicare. Note, though, that this “genetic counseling by a genetics professional” requirement is limited to patients who want multigene panel testing; it is not mentioned in the section on patients who undergo BRCA testing alone. Of course, patients who ask their providers about a multigene panel would need to be referred to genetics professionals. The LCD further points out that the Affordable Care Act mandates private insurers to provide no-out-of pocket cost coverage for genetic counseling and BRCA testing for eligible women. The second major issue – and one that we should welcome but will undoubtedly raises hackles among many genetic counselors – is that the coverage for genetic counseling excludes genetics professionals who are employed by a commercial laboratory. However, genetic counselors would be covered if they “are employed by or contracted with a laboratory that is part of an Integrated Health System which routinely delivers health care services beyond just the laboratory itself.” In other words, a genetic counselor employed by, say, Ambry or GeneDx or Counsyl would not be covered but a genetic counselor who worked for, say, Baylor or the University of Washington would be covered. While we all want to deny that we would actually let conflict of interest color the care we provide, in fact conflict of interest could develop into a very serious threat to the integrity of the profession in the absence of clear-cut guidelines for lab-employed genetic counselors. The third big change is that the new criteria include women who do not have a personal history of breast cancer but have a sufficiently concerning family history of cancer. Until now, only women diagnosed with breast or ovarian cancer were eligible for testing. The new criteria, based on NCCN guidelines, are quite broad, and besides breast and ovarian cancers some of the criteria also include pancreatic and prostate cancers. For example, as I interpret the LCD, testing would be covered for an unaffected woman if she has a first or second degree relative with breast cancer at any age and another relative with breast cancer diagnosed at 50 or younger; or if a first or second degree relative has breast cancer and there are two relatives diagnosed with pancreatic cancer or prostate cancer with Gleason score =7 (surely CMS means ≥ 7 ); or if a woman has a first or second degree relative with ovarian/fallopian tube/primary peritoneal cancer; or if a there is a first or second degree relative with pancreatic cancer or prostate cancer (Gleason score = 7) and there are two or more relatives with breast/ovarian/pancreatic/prostate cancer (Gleason = 7). In a further broadening of criteria, patients with pancreatic and prostate cancers would also be covered, provided they meet family history or ancestry criteria. Critically, the guidelines for testing unaffected individuals specifically apply to unaffected adult women with a family history of cancer; there is no mention of unaffected men. Thus, I assume that an unaffected male who otherwise meets family history criteria would not be covered. However, coverage is provided for men who have been diagnosed with breast cancer, and men who have been diagnosed with prostate/pancreatic cancer who meet family history criteria. While I wholeheartedly support the expanded criteria, they are very, very complicated. It will require careful comparison of pedigrees with the new criteria; I suspect that many errors will unintentionally arise. Some patients who may have been told by their ordering provider that they might be covered will find out that in fact they don’t meet guidelines (hopefully through the careful checking by laboratories before testing is initiated). Other patients will be incorrectly told by the ordering provider that they are not eligible for coverage, resulting in an unfortunate lost opportunity for initiating cancer risk reduction strategies. Another complication lies in the definition of “close blood relatives” which Medicare currently defines this as first, second, and third degree relatives. However, in the proposed LCD, various criteria apply sometimes to first and second degree relatives, and sometimes to third degree relatives. In other places, “close blood relative” is not defined. For example, under the first section titled “Personal History of Female Breast Cancer” the second criterion reads “Diagnosed at age 50 or younger with at least one close blood relative* with breast cancer at any age.” I may have missed it, but I could not find where the asterisked “close blood relative” was defined. Further complicating the matter are criteria that depend on Gleason scores for prostate cancer. Realistically, what patient is going to know Grandpa’s or Uncle Jack’s Gleason score, and if they died 20 years ago, how can the score be found? If a relative died of prostate cancer, there is a pretty good chance he had a high Gleason score but still definitive proof will be hard to unearth. The fourth Big News Item is a limitation on coverage for multigene panels. Currently, I can get coverage for just about any multigene panel that included BRCA, as long as the patient met criteria for BRCA testing. The proposed guidelines, however, limit panel testing to situations where all of the genes on the panel are relevant to the patient’s personal and family history AND the individual meets NCCN guidelines for at least one other hereditary cancer syndrome such as Li-Fraumeni, Cowden, or Lynch. Thus, panels like Myriad’s myRisk, the University of Washington’s BROCA, or Gene Dx’s Comprehensive Cancer Panel would not be covered. Labs will need to do lots of rejiggering of their panels. For Myriad, the proposed guidelines would be an especially big hit since Myriad appears to be phasing out single gene testing and replacing all genetic testing with myRisk. Rubbing a little more salt into Myriad’s wound, the CMS guidelines state that BRCA CDx, the BRCA test intended for patients who are being considered for treatment with the PARP inhibitor Lynparza, will not be covered for patients who have already had BRCA testing. No doubt this LCD will cause strong reactions, both pro and con. Genetic counselor input is critical. It is not a finalized document and we can play a key role in shaping the delivery of medical genetic services. The comment period is 6/17/2015 through 8/3/2015. Per the LCD, the Proposed Contact is Earl Berman, Attn Medical Review, Two Vantage Way, Nashville, TN 37228 or Earl.Berman@cgsadmin.com. I may have misinterpreted parts of the LCD so please call me out if I got something wrong. And share your thoughts about the proposed guidelines in the Comments section below. * To get to the proposed LCD, click on the Accept button at the bottom of the link page, which will take you to the proposed guidelines. So this is where I get confused —- over to the right of the 1st paragraph of the proposed draft, it says Jurisdiction: Kentucky. Do we have new proposals covering the states where the labs are that we use, i.e. California, Utah, MD, TX, etc?? For Medicare recipients, the covered services pertains to that end point. What about the 50 states that each genetic counselor is in?? Does anybody know of central point of this information rather than having to sort through each jurisdictional statement? Yes, I too am confused, since “LCD” refers to a Local Coverage Decision, and each Medicare region has its own rules. So is this really a draft intended for nation-wide implementation? Yes, I agree, it is not clear to those of us with little experience with how Medicare guidelines are implemented if the guidelines apply nationally or locally. However, a heading to the paragraph just above the first criteria section (Personal History of Female Breast Cancer) says “Nationally Covered Indications.” I take that to mean it would be applied nationally, but perhaps different regions would have the ability to nix some of them. Maybe someone can comment who is more familiar with how Medicare guidelines work. Rob – thanks for bringing attention to these draft policies. I could identify two draft LCDs for BRCA testing, DL36115 (from Medicare administrator CGS, covering KY & OH), and DL36082 (from Palmetto, which has jurisdiction over NC, SC, WV, VA). I did not do a careful compare, but they appear to be identical. LCDs apply only regionally, and each Medicare administrator has the option to develop its own policies. NCDs are sometimes developed, and they trump LCDs — behaving like federal law does over state, for example. There are very few NCDs that apply to molecular diagnostics. So, while this is not a national coverage decision at this point, it may very well roll out nationwide. It may take some time for that to happen, as with all government program adoptions. However, I would not assume that just because your state of interest isn’t directly impacted now that you should not pay attention. A precedent is being set. 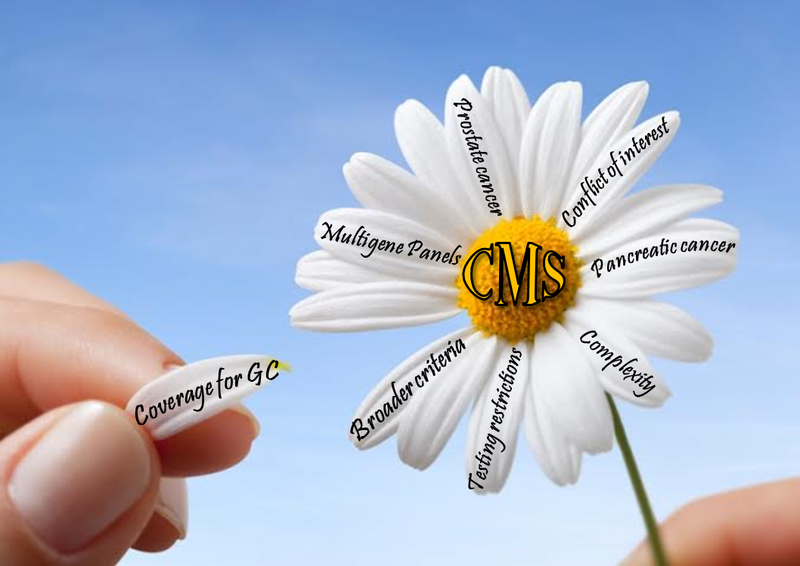 Private payers also consider CMS policies when revising their own.